Ubuntu 18.04 Bionic Beaver was released on 26 April 2018, you can get 05 years support both desktop and server versions and also with Gnome 3.28 by default. This Ubuntu version is providing best boot speed. You can also get web browsers and best utilities. Ubuntu 18.04 has latest Kernel 4.15 and performing best. Previous Ubuntu versions, Ubuntu only supported black and white monochrome emojis, which quite frankly, didn’t look so good. Ubuntu 18.04 will support colored emojis by using the Noto Color Emoji font. With 18.04, you can view and add color emojis with ease everywhere. Ubuntu 18.04, the default graphics server will change to Xorg. Wayland will still be available as an option, but Xorg will be the default, out of the box one. Ubuntu Desktop team has greatly improved and reduced the CPU usage caused by Ubuntu 18.04. Ubuntu 18.04 will collect data like the Ubuntu flavor which you are using, your system hardware stats, your country etc. Anyone can opt-out of this, but it’s enabled by default. What’s interesting about this is that the data they collect will be public, and no sensitive data will be collected. so most of the Ubuntu community supports this decision. Others more lot of changes in this latest version you can do. 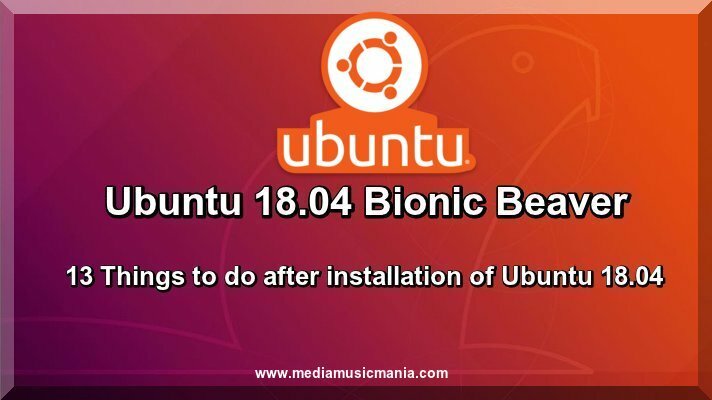 Now I guide you step by step how to download Ubuntu 18.04 Bionic Beaver Desktop version on your PC or Laptop and you can enjoy latest Gnome Desktop 3.28. Ubuntu 18.04 is new and latest version of Linux you can download it from following direct links, and also you can download BitTorrent. Now you have installed Ubuntu 18.04 and now update it to use the following commands in terminal. You canl use the Communitheme, but you’ll have to install it yourself. The Communitheme can be installed easily via a snap, but you can always install it manually to use the following simple commands in terminal. At present the default browser in Ubuntu 18.04 is Firefox but Google Chrome is very popular, you can install Chrome, for Linux Basis System from this link such as Chrome .deb file and run the following command after opening a terminal in the file's location. If you are using Nvidia Graphic Card on Ubuntu 18.04, it is extraordinary until the point that you need the most recent drivers particularly when you are a playing game. Not at all like Windows, Nvidia drivers for Linux desktops are very difficult to find, and introducing the most recent drivers on your Linux Desktop can be a significant challenging procedure. Before installing of Nvidia Drivers you should be check module of your Graphic Driver. Now can also install Nviddia Driver automatically to use the following command in terminal. You have already installed full Multimedia support, Adobe Flash Player is present in your Linux basis system, it is good practice , because you require that playing Flash Videos and other purpose. The main source of this process is often not updated quickly enough, which makes your system helpless. So you require replace and install the following Flash plugin that source by another one, it is important and to deliver security updates quickly. Now use the following command in terminal and install it. Install Java 8 on Ubuntu 18.04, the latest versions of Java creating problems. It is better way to install Java 8: Java 8 is best for Ubuntu 18.04, do not use Java9, Java 11 because security update problem in Java 9 and Java 11 so it is better that install Java 8. Now you can install most popular and important software on Ubuntu 18.04. In this regard I have selected most popular software and they are mostly required to use Linux basis system. Install QBittorrent Client: Install QBittorrent Client Best Torrent Server for Linux and very popular install it to use the following command in terminal. Remove Audacity: If you ant to remove Audacity to use the following command in terminal. sudo apt-get remove audacity Video Conference Software: This is great software VoIP client and modern video conference Software. It costs around 18 MB in Linux Mint 18 Cinnamon. To us the following command in terminal and install it easily. Get More Space and Keep Fresh System Now clean up Ubuntu 18.04 and fresh up your system and take more space use the following commands in terminal.